What Comes First? Saving or Paying Off Debt? This is probably one of the most popular personal finance dilemmas. Indeed there seems to be no straight answer when it comes to the decision of paying of your debts first or setting some money aside for savings. Naturally, there are two sides to the argument and in order for you to decide what you should be doing, it’s best to see what each side has to offer. 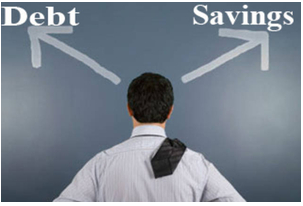 Pitting savings over debt repayment can sometimes be a matter of opportunity cost. If you don’t pay off that debt just yet, what can you do with the money that can override the interest you’re gaining for every month you fail to pay? Credit card interest rates are among the highest rates when it comes to personal loans. The average credit card interest rate is around 16.8%. Having that figure, think about what kind of investment vehicle your money is already in, and if it beats that 16.8% rate. If your money is just stuck in a savings account that offers a mere 1% interest, then you’re obviously losing money by failing to pay off your debt. On the other hand, if your current debt is a home refinance mortgage at a rate of 3-4%, plus you happen to be financially adept at certain investment vehicles, then you would know that there are areas where you can place your money for it to grow at a higher interest rate. This doesn’t mean defaulting on payments, but rather just paying off your mortgage slowly while keeping the rest of your money invested in higher return vehicles. Other opinions say that paying off debt before establishing an adequate emergency fund is just completely pointless. The moment you fall into a financial crisis, you’ll eventually end right back into that debt hole. This is a completely practical notion, and for those who haven’t established even a small amount of savings should probably do so first. The trick is to save about 6 months worth of expenses and to keep it in a liquid account, so that in case anything goes wrong, you’d have enough to cover your expenses without having to borrow money again. So what should you do first then? Save or pay off debt? Well the answer does somewhat lie in relation to your current situation. Think about what you will be losing, and what you will be gaining, should you choose one option over the other. Ideally, it its possible to do so, doing both at the same time would probably be the best solution. In that way, you’d be hoarding less in interest, while creating an emergency fund for yourself when needed.